The Power of the Dark Crystal #3 Review – AiPT! Thurma, the childish Fierling has not heeded everyone’s warning. She has succeeded in cracking the crystal in hopes of saving her world. Trouble is brewing in the castle as the Skeksis have been set free! The Skeksis have barely stretched their decrepit limbs when the infighting begins. They want to persecute someone for their 100 year incarceration. Ah the blame game. We are quickly reminded of the differences between the Skeksis and the Mystics. As the Skeksis seek vengeance the Mystics are peaceful and complacent letting chaos ensue around them. After the striking cover featuring a Skeksi for issue #2, I expected that their return would warrant a mind blowing full page. The page was mutely colored, which could be trying to portray the crystal’s light but I wanted saturation and striking visuals. I was a bit disappointed to see that the Skeksis were simplistic and without detail in their debut. Their craggy beak faces and gnarled limbs appeared smooth. In a few panels I felt their heads were more turtle-like in appearance rather than buzzard or vulture which is what is expected. As the panels progressed the details of their robes and teeth evolved but the initial appearance was underwhelming. This is meant to be the ultimate threat returning to Thra and yet the coloring and expressions were bland. It was not the spectacle I had hoped for but luckily the rest of the issue did not disappoint. Conniving Chamberlain is back and on the outs again. He seeks the shard as a way to regain power. One of my favorite panels in this issue is of Chamberlain as he is trying to squeeze through a cave opening while trying to lure Thurma and Kensho into helping him. This is a skillful rendition of a Skeksi and the art is striking here, especially Chamberlain’s angular and pronounced brow line, the jagged teeth, beak like nose and raggedy feathers poking out of his torn robes. His squinted eye and tilted head just ooze slyness. If there were no dialogue on this page you would still understand that he is up to no good. The dialogue is true to the characters closely echoes the movie. Anyone who has seen the movie can hear the characters in their head. The evil and bickering nature of the Skeksis is captured very well. Aughra’s frustration and chastising of the Fireling is also well suited to her nature. She must be tired of predicting trouble and no one listening. Thurma’s innocence and childlike nature comes through in her dialogue as well. She frequently mentions bullies and how everyone is “mean” or “greedy”. You understand that this is a young being that has been shouldered with a great responsibility. Like the original movie, this story is reliant upon one young creature’s determination to save their world. This time it is Thurma and she will let nothing stand in the way of her mission. Her naivety about consequences and the larger world will have to change if Thra stands a chance of survival. Time will tell if Kensho can help her see that his world relies on the crystal being intact and that they must seek another way. 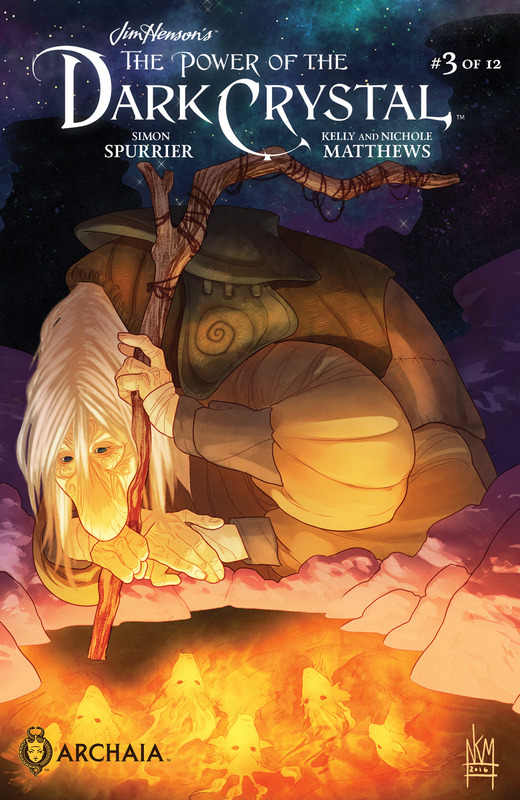 The Power of the Dark Crystal #3 is an engaging page turner that makes you feel as if you never left the magical world of Thra. This is a must read series for Dark Crystal fans.